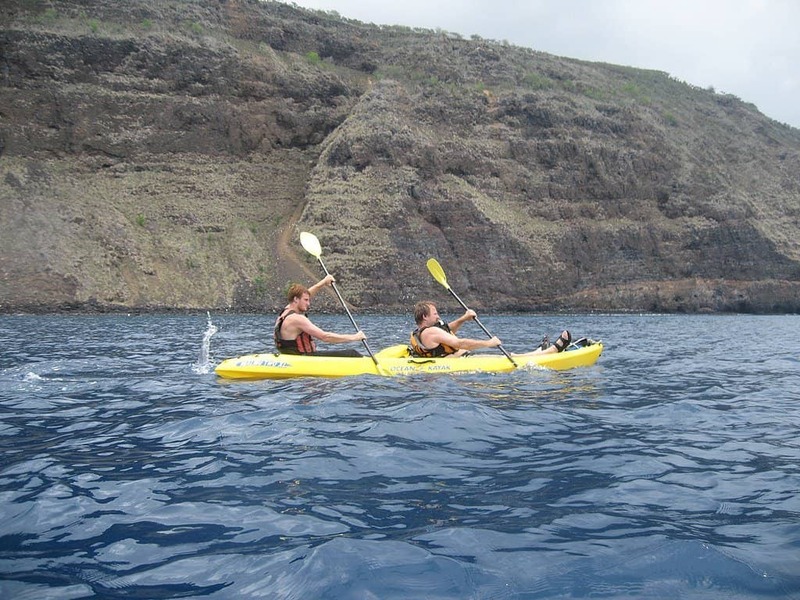 Tandem kayaks and canoes are both excellent ways for two people to spend a day together on the water. With experienced paddlers, both types of boat can be incredibly fast and maneuverable. However, both have their advantages and disadvantages, and they work best in different environments. It’s important to consider how you intend to use your tandem kayak or canoe before purchasing one or the other. There are three main differences between tandem kayaks and canoes: sitting position, paddle type and exposure to the water. Kayakers sit inside a low-in-the-water hull with their legs out in front of them, propel themselves with a double-ended paddle, and use a sprayskirt (or at least a mostly enclosed cockpit) to prevent water from splashing into the boat. In a canoe, on the other hand, paddlers sit on raised seats or kneel inside the hull, propel themselves with a single-ended paddle, and have an open hull that sits high enough in the water to be protected from splashing water. Both are excellent vehicles for moving around in the water, but those attributes determine where each one is best used. The most noticeable of the differences between tandem kayaks and canoes is the exposure to water. In choppy water, you’re much more likely to get splashed in a kayak than in a canoe. However, because the boat is designed for that kind of exposure and presumably has a sprayskirt, they’re a better choice for rough waters like river rapids. Even though tandem kayaks are a similar length as canoes, they still encounter less resistance from the water because of their low profile design. This means beginners usually have an easier time paddling a tandem kayak than a canoe. Many people believe (falsely) that tandem kayak can be more efficiently paddled than canoes – you’ve got two blades, how could it not be? This belief is wholly untrue though, the two people paddling a kayak need to be perfectly in-sync to keep the boat going straight and not bang their paddles together. Canoes require much less coordination between paddlers, and if the boat does get off-center, it’s a fairly easy correction to make. With two experienced paddlers, a canoe can actually have a higher top speed than a tandem kayak. Depending on your personal preferences, a canoe can be more or less comfortable than a tandem kayak. If you’ve got a bad back and need a solid backrest to hold you up, a canoe can feel like torture. But if you have no trouble sitting on a stool for hours at a time, canoes feel great, with plenty of space to move your legs and torso around. If it ever does become uncomfortable, you can shift your weight in a canoe without tipping the boat; shifting around in a kayak is definitely more risky. Lastly, canoes are great for when you need to portage often. In fact, it’s one of the reasons early explorers used canoes for river travel instead of kayaks. A kayak has to be hoisted sideways onto your shoulder, and even the most experienced paddlers can have trouble balancing the boat if it’s very long. Doing that motion in tandem – nearly impossible. The two paddlers have to instead carry the boat by the grab handles, and carrying a boat with our arms is much less efficient than using our torso (hauling a tandem kayak together is also not generally a great recipe for friendship). Canoes are much easier to carry, as one person can lift the overturned canoe on their head and shoulders, while the second person steers from the bow and looks out for obstacles. Tandem Kayak or Canoe – What Should I Do? What kind of trips do you see yourself taking? Do you expect to be portaging very often? A kayak will just be a hindrance there. Do you think you’ll be encountering rough waters, like rapid-filled rivers or the ocean? A canoe won’t be very effective at keeping the water out. Tandem kayaks are best for paddlers who want to be able to navigate a wide variety of waters, while canoes are best suited for those who are concerned about cargo capacity and comfort, both inside the boat and when portaging it. Good article, thanks. Lake/reservoir = canoe?